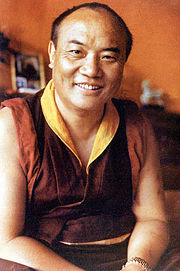 The 16th Karmapa, Rangjung Rigpe Dorje (1924 - 1981), was considered to be a Tulku (reborn spiritual master). A tulku (སྤྲུལ་སྐུ, also tülku, trulku) is a Tibetan Buddhist Lama ("Spiritual teacher") who has taken the Bodhisattva vow of helping all other sentient beings to escape Samsara (the wheel of suffering) and has consciously determined to be reborn to continue his particular lineage. The most famous example of a tulku lineage is the Dalai Lamas, who are said to be rebirths of the previous thirteen Dalai Lamas, beginning with Gendun Drup (1391 – 1474 C.E.). It is held in the Vajrayana tradition that the oldest lineage of tulkus is that of the Karmapas (spiritual head of the Karma Kagyu lineage), which began with Düsum Khyenpa (1110-1193 C.E.). The term tülku is the Tibetan translation of the Sanskrit philosophical term nirmanakaya. According to the philosophical system of Trikaya ("Three bodies of Buddha"), nirmanakaya is the Buddha's "body" in the sense of the bodymind. Thus, the person of Siddhartha Gautama, the historical Buddha, is an example of nirmanakaya. In the context of Tibetan Buddhism, tülku is used to refer to the corporeal existence of enlightened Buddhist masters in general. Thus, because the ongoing manifestation of a tulku is held as a continuation of their mindstream independent of bodymind, the new manifestation came to be referred to as a tulku. This is the sense in which "tulku" is generally employed in English. The institution of the tulku as developed during the twelfth, thirteenth, and fourteenth centuries, as various Tibetan schools of Buddhism began to accept the possibility that exemplary figures might remain within the human world as institutional teachers, manifesting from one lifetime to the next out of compassion. At this point, the notion of nirmanakaya became linked to a notion of regular re-manifestation (Tibetan: yangsi; Wylie: g.yang-srid). The most dramatic—and, at the time, controversial—innovation here was the idea that a tulku could inherit the estate (labrang) of their previous incarnation. This rule of inheritance allowed for the rise of hugely wealthy estates belonging to the lineages of reincarnating tulkus. The first recognized tulku of this kind within the Vajrayana traditions was the Karmapa, the head of the Karma Kagyu school of Tibetan Buddhism; precisely, the first to be recognized as a re-manifestation was the second Karmapa, Karma Pakshi (1024-1283 C.E.). The Karmapa is now in his 17th incarnation. By far the most politically powerful tulku lineage for the past several hundred years has been the Dalai Lamas, which has seen a total of fourteen incarnations beginning with Gedun Drub. The title "Dalai Lama" was not applied to this line from the beginning: the second incarnation was seen simply as the rebirth of Gedun Drub. The same was true of the third incarnation, Sonam Gyatso, until he was dubbed "Dalai Lama" as an adult, after which he applied the title posthumously to his predecessors and declared himself the 3rd Dalai Lama. It was Lobsang Gyatso (1617–1682 C.E. ), the 5th Dalai Lama, who established the Dalai Lamas as Tibet's predominant political power. After their control was consolidated, recognition of some of the most important tulkus was vetted by the government at Lhasa, and could on occasion be banned if its previous incumbent fell out of favour. A notable example of this penalty was the Shamarpa, once the most powerful subordinate of the Karmapa, who was banned from reincarnating by order of the Dalai Lama in 1792. This ban remained in place until after the Dalai Lama lost power in Tibet during the 1950s, although it was later revealed that the Karmapa had recognized reincarnations of the Shamarpa secretly during the intervening period. Lineages of tulkus may be interlinked—for example the Panchen Lama traditionally recognizes the new incarnation of the Dalai Lama and vice versa. In most cases there is no such relationship, but the potential candidate is always vetted by respected lamas. This often involves tests such as checking whether the child can recognize acquaintances or possessions from his previous life or answer questions only known to his former self. According to the book, Magic and Mystery in Tibet by Alexandra David-Neel, “A number of objects such as rosaries, ritualistic implements, books, tea-cups, etc., are placed together, and the child must pick out those which belonged to the late tulku, thus showing that he recognizes the things which were his in his previous life. This process was portrayed in the movie Kundun. As a tulku nears death, the people around him listen carefully for clues that may help in finding his future rebirth. Sometimes, a tulku will leave a prediction letter or song describing where they will be found. Prophecies, which may date forward or backward many generations, also play a role. While most tulkus historically have been Tibetans, some have also been born among various other peoples with whom the Tibetans have had contact, such as the Mongols. There have also been some tulkus closely associated with Tibetan Buddhist practice in some country outside of Tibet, and these have typically been born in that country; an example is the Jetsun Dampa of Mongolia. In modern times, as Tibetan Buddhism has attracted followers across the world, a small number of tulkus have been found among Western people. Perhaps the most religiously significant such tulku is Tenzin Ösel (born 1985), the child of Spanish parents, who has been recognized as the reincarnation of Thubten Yeshe, an influential Tibetan lama. Another notable case is that of the American film star Steven Seagal, who, while already an adult, was recognized by Penor Rinpoche, the head of the Nyingma school, as the reincarnation of a seventeenth-century tertön from eastern Tibet, Chungdrag Dorje. Penor Rinpoche notes that "such recognition does not mean that one is already a realized teacher"; Seagal has not been enthroned and has not undergone the extensive program of training and study that it is customary for a tulku. Another Westerner who has been recognized as a tulku is Lama Shenphen Rinpoche, who was officially recognized by the board of Kharnang Monastery, and the Jhadrel Khangtsen of Sera-Jhe Monastic University. A recent Chinese word for tulku is huófó (活佛), which literally means "living Buddha." Thus, the term Living Buddha is sometimes used to mean tulku, although this is rare outside of Chinese sources. Modern Chinese sources typically refer to a young incarnation of a (presumably male) tulku as a "soul boy" (Traditional Chinese: 靈童; pinyin: língtóng). ↑ Alexandra David-Neel, Magic and Mystery in Tibet (New York: Dover Publications, Inc., 1971, ISBN 0-486-22682-4). ↑ Statement by H.H. Penor Rinpoche Regarding the Recognition of Steven Seagal as a Reincarnation of the Treasure Revealer Chungdrag Dorje of Palyul Monastery Retrieved April 8, 2008. ↑ Buddhist Congregation Dharmaling - Recognition documents Retrieved April 8, 2008. This page was last modified on 8 April 2008, at 20:22.